Lincolniana is Abraham Lincoln memorabilia and ephemera in a variety of formats, ranging from the serious and scholarly, to the outright silly and satirical. Here are some Lincoln pennies that have been encased mostly in aluminum casings, but in other materials as well. Some messages relate to some aspect of Lincoln's life; most relate to the fact that the penny has some monetary value. This encasement is a "pot of money" that holds a 1912 D Lincoln cent. The encasement says, "GO WAY BACK AND SIT DOWN / A POT FULL OF MONEY / KEEPME AND NEVER BE CAUGHT SHORT." The reverse says, "SOUVENIR / NIAGARA FALLS / GOOD LUCK / I HAVE BEEN TO NIAGARA FALLS AND GOT CLEANED." 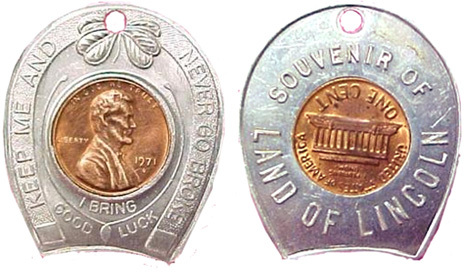 Souvenir encased pennies were to be had at the 1962 World's Fair in Seattle. This one sold on eBay in a February 2010 auction for $19.50. The front side says, "KEEP ME AND HAVE GOOD LUCK / I BRING GOOD LUCK." 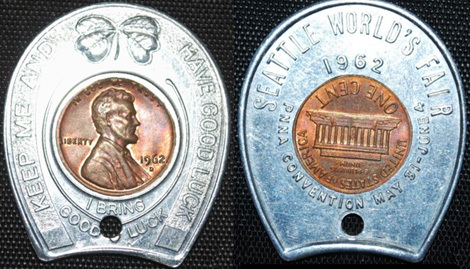 And the reverse: "SEATTLE WORLD'S FAIR / 1962 / PNNA CONVENTION MAY 31 - JUNE 4." This 1909 Lincoln penny is encased in another common shape: the circle. "DEARDEN'S FURNITURE CO, INC / EVERYTHING FOR YOUR HOME / 712-718 S. MAIN ST / LOS ANGELES, CAL." The reverse says, "GOOD ON PURCHASES / $1.00 ON $10 TO $50 / $2.50 ON $50 to $100 / $5 ON $100 OR MORE." This 1948 Lincoln penny appears to be encased in plastic or bakelite. 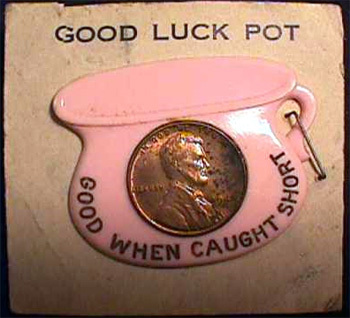 It is a good luck pot. The front says, "GOOD WHEN CAUGHT SHORT." The reverse design is unknown. A recent encasement pays tribute to Abraham Lincoln's Bicentennial with a 2009 Lincoln log cabin penny. This one is encased by Penny Press Mint. The obverse features the signature of Abraham Lincoln. It says, "NOW HE BELONGS TO THE AGES / 1809-1865." The reverse quotes the ending lines of Lincoln's Second Inaugural Address: "With malice toward none, with charity for all, with firmness in the right as God gives us to see the right, let us finish the work we are in."